DEEPAK CHOPRA MD, FACP, member of Oprah's SuperSoul 100, founder of The Chopra Foundation, and co-founder of The Chopra Center for Wellbeing is a world-renowned pioneer in integrative medicine and personal transformation. He is the author of more than 80 books translated into over 43 languages, including numerous New York Times bestsellers. Two of his books, Ageless Body, Timeless Mind (1993) and The Seven Spiritual Laws of Success (1995) have been recognized on The Books of The Century Bestsellers List. He serves as an Adjunct Professor at Kellogg School of Management at Northwestern University, Adjunct Professor at Columbia Business School, Columbia University, Assistant Clinical Professor, in the Family and Preventive Medicine Department at the University of California, San Diego, Health Sciences, Faculty at Walt Disney Imagineering and Senior Scientist with The Gallup Organization. TIME magazine has described Dr. Chopra as "one of the top 100 heroes and icons of the century” and credits him as "the poet-prophet of alternative medicine." ​ ​The WorldPost and The Huffington Post global internet survey ranked Dr. Chopra #40 influential thinker in the world and #1 in Medicine. DR. RUDOLPH E. TANZI, Ph.D. is Professor of Neurology and holder of the Joseph P. and Rose F. Kennedy Endowed Chair in Neurology at Harvard University. He serves as the Vice-Chair of Neurology and Director of the Genetics and Aging Research Unit at Massachusetts General Hospital. Dr. Tanzi is a pioneer in studies aimed at identifying genes for neurological disease. He co-discovered all three genes that cause early-onset familial Alzheimer’s Disease (AD), including the first AD gene, and currently spearheads the Alzheimer’s Genome Project. He is also developing new therapies for treating and preventing AD based on his genetic discoveries. Dr. Tanzi was named to TIME magazine’s TIME 100 Most Influential People” for 2015, and to the list of Harvard 100 Most Influential Alumni. He has also received the highly prestigious Smithsonian American Ingenuity Award for his pioneering studies of Alzheimer’s disease. He is the co-author of the New York Times best seller Super Brain with Dr. Deepak Chopra, has professionally played keyboards with Joe Perry and Aerosmith, and is the host of Super Brain on public television. “In Super Genes, Drs. Deepak Chopra and Rudolph Tanzi illustrate the interplay of nature and nurture using cutting edge genetic science and argue persuasively that adapting one’s lifestyle can maximize the potential to transcend the inherited susceptibilities handed down to us from our parents." "The concept that biology is destiny is one of the most pathological and toxic exaggerations to emerge during the entire scientific era. This hard-core materialistic view has been a kind of psychological enslavement that has pushed many people into nihilism and despair. In Super Genes, Drs. Deepak Chopra and Rudolph E. Tanzi discuss new evidence that our genes are not our masters, but they respond in large measure to our choices and behaviors. The resulting view honors not just the body but mind and spirit as well—a vision that is as bright and hopeful as the old view was morbid and depressing. Super Genes is an important book. It will empower anyone who reads it, because it expands our view of what it means to be human." 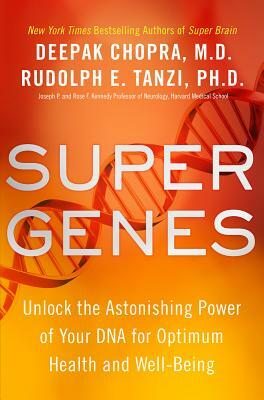 "Super Genes demolishes the myth that our genes determine our fate. Deepak Chopra and Rudy Tanzi explain in breathtaking detail the magic of how our diet, lifestyle, our thoughts and even our gut bacteria or microbiome "talk" to our genes, regulating which genes get turned on or off, or turned up or down influencing every aspect of our health. This is essential reading for anyone interested in turning on their health, weight loss, happiness and longevity genes!" "A ground breaking and eye-opening account of recent discoveries in two new fields - epigenetics and microbiomics - weaved with practical insights to optimize our own wellness and longevity. Rudy Tanzi and Deepak Chopra, renowned pioneers in their respective fields, have written one of the most important health books of the year."